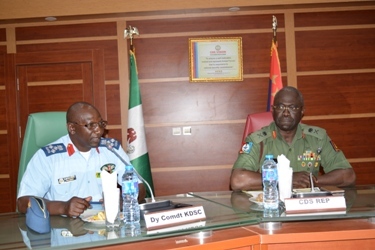 The Chief of Defence Staff (CDS) General Abayomi Gabriel Olonisakin has re-iterated the Nigerian Armed Forces commitment to partner any country in the sub-region or Africa to fight terrorism or any militant group to a standstill. General Olonisakin made this disclosure when student officers of Kenyan Defence Staff College led by their Deputy Commandant, Brigadier General SM Wachira visited Defence Headquarters recently as part of their Geo – strategic tour to under study the ongoing success story of the Nigerian Military’s fight against the radical Islamic terrorist group, Boko Haram in the North East of Nigeria. The CDS, who was represented by the Chief of Training and Operations, Defence Headquarters, (DHQ) Major General BT Ndiomu welcomed the team to DHQ. In his remark he observed that Africa as a continent is witnessing serious threats from terrorist organisations and urged all regional security forces to close ranks in the fight against terrorism. He also noted that the Kenyan Government has been battling the notorious Al-Shabab militant group, which has links with Al-Qaeda terrorist network and assured the delegation of Nigeria’s support for their efforts in combating the deadly militant group. Speaking earlier, Brigadier General Wachira stated that their visit was occasioned by the similarities in the security challenges facing Nigeria and Kenya and the need to share and learn from the Nigerian military experience in degrading the Boko Haram terrorists. During the visit the Kenyan delegation was also briefed on the activities of the Multi-National Joint Task Force and the Nigerian Armed Forces tremendous efforts in deradicalizing the civil populace and the jobless youths in the North who may be willing to join the radical Islamic Sect, out of frustration from harsh economic situation. The climax of the event was the exchange of souvenirs and group photographs by some Principal Staff Officers of the DHQ and the Kenyan delegation.